People often think of weather-proofing, or weatherizing as just sealing out the rain. And while it’s true that your door does provide a safeguard between you and the weather and temperatures outside, trough door weatherization, you can also stop drafts, increase your comfort, and reduce your energy costs. If your door has not been maintained well over the years, there is a good chance that wear and tear has created gaps and cracks that allow air and water to leak through. Doors of Elegance provides door weatherization service in New Orleans, Mandeville and the entire metro area to help you stop this problem. By calling 504.887.5440, you can find out more about how you can have your door weatherized. It is fairly simple to determine whether or not your door is in need of weatherization services. When you close your door, there should be an airtight seal that forms around the door. You can see if this seal is broken by looking for signs of sunlight or air coming in around the entrance. Sometimes, if there is not an extreme temperature difference, or if the wind is not blowing, it can be difficult to know if air is coming in around the door. You can test this by holding a candle or lighter up to the area to see if the flame is affected. Always take all of the necessary safety precautions when using this method. 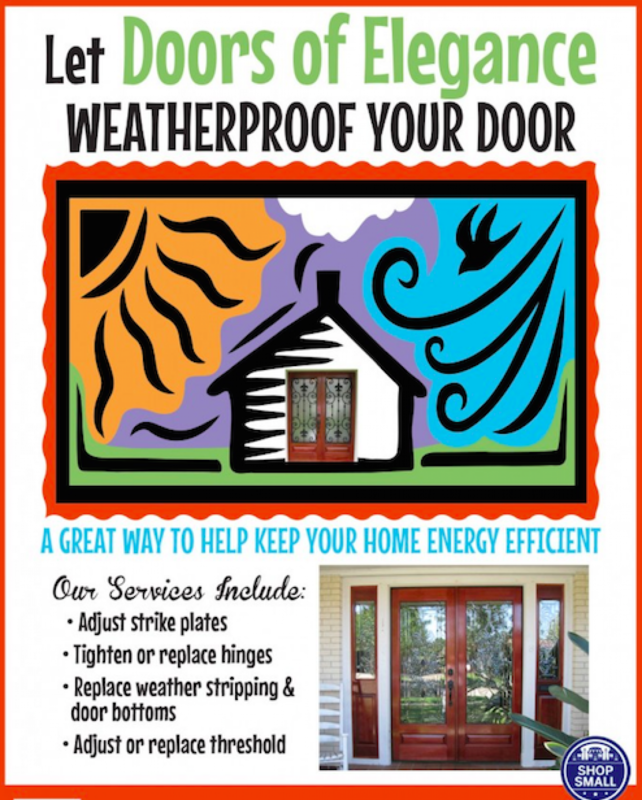 If you are unsure whether your door would benefit from additional weatherization, call Doors of Elegance to receive a professional opinion and quote for service. What Does Door Weatherization Entail? In many cases, weatherization does mean replacing weather-stripping and door bottoms that have become worn and damaged over time. By enlisting the services of professionals, you can ensure that these implements are installed correctly, and that the highest quality materials are used for the job. If weatherization products are not installed correctly, this will often mean that either the products or the door will not function as desired. In some cases, there are other elements within the entire threshold that need to be adjusted or repaired during the weatherization process. The experts at Doors of Elegance can inspect your entrances, making the necessary changes. The result will be a door that opens and closes easily, but seals tightly. If you would like to better protect your home from the elements, Doors of Elegance is ready to help. To receive a quote for door weatherization, call our Metairie showroom at 504.887.5440 or reach us by email at Info@DoorsOfElegance.com.